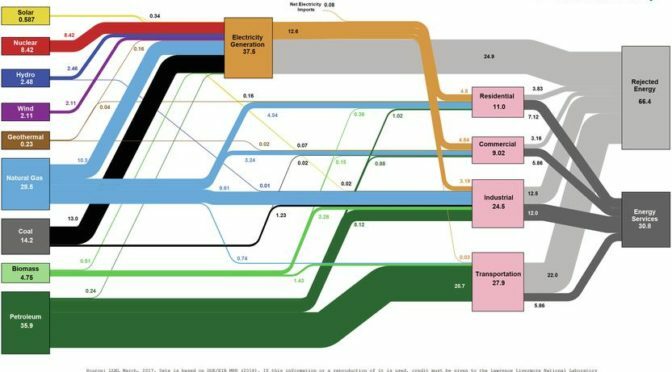 As insane as this level of waste is, it’s still merely the US government’s own public depiction of how wasteful and destructive the extreme energy system is and incorporates all the most optimistic and manipulative methods of measure. The real number no doubt is much worse. By one alternative measure the level of energy actually used serviceably is only 13%, with the rest being pure waste. In the case of corporate industrial agriculture, the bulk of the rejected energy spews from its industrial processes and globalized commodity transportation (“food miles” as well as input miles; the global South is forced to import the vast bulk of the industrial seeds, fertilizer, pesticides, and machinery required to grow the commodity crops globalization has forced upon it), though Western-style retailing and end-consumer food preparation also uses a large amount of energy. All these processes also are dependent upon the electricity generated with such extreme wastefulness. The astronomical amount of industrial agriculture’s rejected energy is all from a sector which in its so-called “services” as well is only inefficient, wasteful, and destructive. These typical examples demonstrate how the measure of Rejected Energy only scratches the surface. This is the corporate globalization system itself admitting how grossly wasteful it is according to its own measure of what comprises a “service”: The same measure which values a death camp according to the construction work performed and the volume of Zyklon B sold, and values at zero the care a mother provides for her infant. As grotesque as the amount of the system’s officially acknowledged rejected energy is, the measure becomes even more profoundly abysmal when we ponder the “services” the non-rejected energy actually provides: According to any human measure, the great bulk of these as well are not just a waste, but deeply destructive of humanity and the Earth.